Republican presidential candidate Mitt Romney pulled an unflattering video about rival Rick Perry from the Web after cable giant CNN complained about the use of comments from its correspondents in the ad. The ad featured some of the Texas governor's worst moments from recent candidate debates, including a stumbling attempt by Perry to portray Romney as a flip-flopper on abortion rights. In the opening footage, CNN political analyst Gloria Borger is shown commenting, "Republicans need to believe that if they are going to nominate somebody, this person can stand next to Barack Obama on the stage and go at him and do well at it." Then, in video from the September candidates' forum in Orlando, Florida, Perry is shown standing at the debate podium saying, "Was it -- was before he was before the social programs, from the standpoint of he was for standing up for Roe v. Wade before he was against Roe v. Wade?" The ad titled "Ready to Lead?" was taken down late Wednesday, apparently after a complaint from CNN. Andrea Saul, a spokesman for the former Massachusetts governor, said, "While the use of the CNN clips was fully within our rights under the law, we respect and appreciate the role CNN has played as host in debates over the last several months. For this reason, we are honoring their request to remove the video." In a statement, CNN said that the network, "did not consent to the use of its copyrighted material for this ad, and CNN objects to the use of its talent in any campaign ad. We respectfully requested that the Romney campaign not use CNN material in their campaign ads and they complied." A portion of the ad appears on the video aggregation website YouTube. http://www.youtube.com/embed/JT76BIvGsTc"
Below is a transcript of the ad, which the campaign introduced to reporters as providing highlights of "Rick Perry's inability to discuss the issues." AD FACTS: Script for "Ready To Lead?" CNN's ANDERSON COOPER: "And welcome to the Sands Convention Center at the Venetian in Las Vegas." CNN's JOHN KING: "It is Rick Perry's moment of truth." CNN's GLORIA BORGER: "Republicans need to believe that if they are going to nominate somebody, this person can stand next to Barack Obama on the stage." RICK PERRY: "Was it -- was before he was before the social programs, from the standpoint of he was for." CNN's RANDI KAYE: "Do or die for him." RICK PERRY: "Not whether or not we are going to have this policy or that policy. ...We don't need any plan." 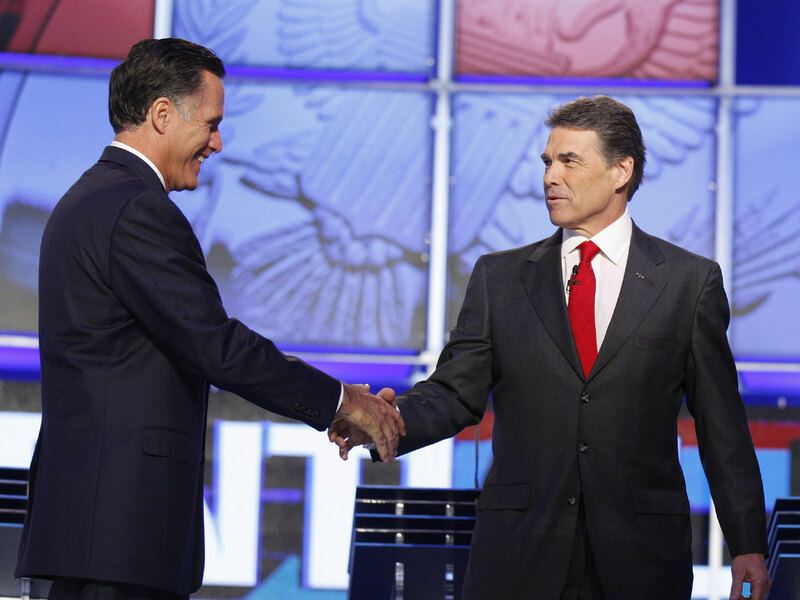 FOX NEWS' BRIT HUME: "Perry did really throw up all over himself in the debate." RICK PERRY: "But the fact is, Americans understand faith." CNN's CAROL COSTELLO: "Rick Perry plunging in the polls, rolling the dice." NEVADA GOP CHAIRWOMAN AMY TARKANIAN: "He would just calm down. He seemed very agitated." REDSTATE's ERICK ERICKSON: "Set the benchmark so low at the last debate." RICK PERRY: "I mean we'll wait until tomorrow, and see..."
FOX NEWS' GRETCHEN CARLSON: "He doesn't have his economic plan yet." REDSTATE's ERICK ERICKSON: "All he had to do is show up and smile." THE WASHINGTON POST's DANA MILBANK: "He's just a shadow of his former self." CNN's GLORIA BORGER: "You cannot do that debate with other Republicans he's going to have a hard time against Barack Obama."